Facebook/WhatsApp/IMO are free up to 25MB per day. After that pay-as-you-go or base pack shall be applicable. 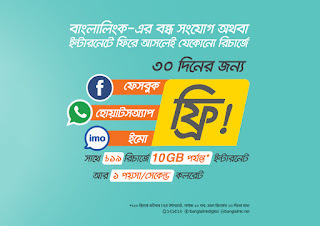 On exact recharge of 39Tk, special tariff of 0.5paisa/second (Banglalink-Banglalink) & 1paisa/second (Banglalink-other local operator) shall be activated. Validity will be 3 days including the day of recharge. This special tariff is not applicable on Bonusminutes and Bundle minutes. Bonus minutes and Bundle minutes will be consumed first. While enjoying this special tariff, other special tariff offers will not be applicable. After the special tariff validity period, customers will go back to their previous offer/package.